Liz Purdy, Outreach and Events Coordinator, reflects on her JV year at a domestic violence shelter and the continued commitment of JVs who walk alongside domestic violence survivors throughout the Northwest. October marked Domestic Violence Awareness Month and, though the month is over, raising awareness about cycles of abuse and interpersonal violence continues. My first day as a JV, I walked into the local domestic violence shelter in Sitka, Alaska where I served as a women’s advocate, having little understanding of the complexities of domestic violence. Throughout the year, I came to learn that domestic violence is really an umbrella term for many interrelated issues—addiction, child abuse, verbal abuse, mental illness, etc.—often times all simultaneously contributing to an abusive situation. 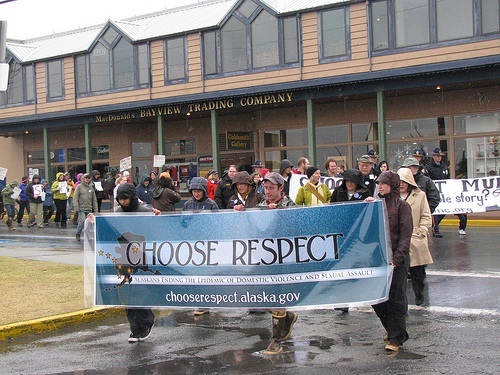 Liz Purdy, right (Sitka, AK ’10-11) and Nick Campolettano, middle, (Sitka, AK ’09-10) carry the “Choose Respect” sign through Sitka showing local support for D.V. survivors. My ideas of why women return to abusers, what kind of people are charged with felonies, who makes a good parent, and what defines healthy communication were all challenged during my year as a JV. I found myself walking alongside (sometimes literally, other times figuratively) survivors of domestic violence and sexual assault, often in circumstances where I felt unable to offer anything but a listening ear, a smile, or simply my presence to women in crisis or who were processing trauma. 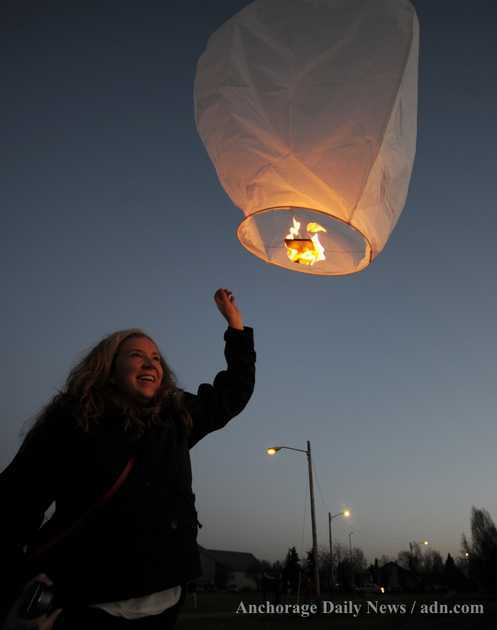 Current JV Claire Shepek (’12-13 Anchorage, AK) releases a lantern in recognition of Domestic Violence Awareness Month. Though I only remained as a women’s advocate at the domestic violence shelter for my JV year, roughly ten percent of JVs currently serve in the field of domestic violence. Current JV Claire Shepek (’12-13 Anchorage, AK) participated in a vigil for survivors of domestic violence and sexual assault, hosted by her placement agency, AWAIC. As part of the vigil there was a time of prayer for everyone affected, and then a chance to go outside and light lanterns (essentially mini hot air balloons) as a symbolic act of raising awareness. The Anchorage Daily News captured the evening with a gallery of beautiful photos.